Michael: I'm wondering if you've considered taxes in your experiments. I'm guessing that the market timer would have to pay more in taxes considering that interest income is fully taxed and capital gains are owed when the total gains becomes positive. I'm guessing taxes will put the market timer into a bigger hole. CC: You're abosulutely right. My analysis is based on the assumption that the investment is made in a tax-sheltered account. For many people, this is the only way they will ever invest. I'll see about following up next week with what happens when taxes have to be paid. Micahel, great post and very interesting results. It is one thing to read that market timing doesn't work another to see it in numbers based on probability and simulation models. My only issue is that market timers don't really toss a coin when deciding, so it is not completely random. One strategy that I know some people follow is to cash out after a significant run (say 5% from a recent low) in a certain period (could be week/month/quarter) and get back in after a significant fall (say 5% from a recent low). I don't believe in market timing strategies either, but what are your thoughts on this and how much does it affect the simulation you ran? Jay: I agree that market timers base their decisions on some sort of information rather than just making random choices. However, my conclusion that you have to be right 60% of the time (and trade with someone who is wrong 60% of the time) just to break even with buy-and-hold is still true. I'll take another look at this issue next week. I could try something along the lines of what you describe. This can be a dangerous practice, though, because I may end up finding a strategy that would have worked out well over the last 17 years, but will be ineffective in the future. Sometimes with back-tested strategies, all you are doing is fitting a strategy to the particular gyrations of the stock market over the time period you are studying. People spend all this time trying to figure out "What time of the year should I make an investment? When should I invest?" And it's such a waste of time. It's so futile. I did a great study, it's an amazing exercise. In the 30 years, 1965 to 1995, if you had invested a thousand dollars, you had incredible good luck, you invested a the low of the year, you picked the low day of the year, you put your thousand dollars in, your return would have been 11.7 compounded. Now some poor unlucky soul, the Jackie Gleason of the world, put in the high of the year. He or she picked the high of the year, put their thousand dollars in at the peak every single time, miserable record, 30 years in a row, picked the high of the year. Their return was 10.6 That's the only difference between the high of the year and the low of the year. Some other person put in the first day of the year, their return was 11.0. I mean the odds of that are very little, but people spend an unbelievable amount of mental energy trying to pick what the market's going to do, what time of the year to buy it. It's just not worth it. Preet: I agree with Peter Lynch about not obsessing about what time of year to make investments. His experiment is different from mine, though. Peter supposed that you were going to buy and hold for 30 years, and he concluded that it doesn't matter very much what time of year you buy before your 30-year hold. I'm looking at market timing where the "investor" jumps in and out of the market. For my experiment, timing makes a huge (negative) difference. Our conclusions are about the same, though: market timing isn't worth it. "and get back in after a significant fall (say 5% from a recent HIGH)". Michael: are you saying that no matter what the strategy is, one would still have to be right 60% of the time to be able to match the buy-hold returns? Thanks again for another enlightening post. Your writing is so clear and your blog is one of the best I have ever read about investing. Jay: Under normal market conditions, yes, a market timer investing in a tax-sheltered account making a decision once a month about whether or not to be in the market would have to guess right 60% of the time to keep pace with a buy-and-hold investor. It is possible for there to be extreme market conditions that affect this, though. Suppose that there is one month with a -99% return. In this case, your overall performance would depend on little other than whether you were invested during this month or not. In general, you can be right less than 60% of the time if you happen to be right in the most extreme months. But, I see no reason to believe that anyone can reliably predict which months will be extreme. 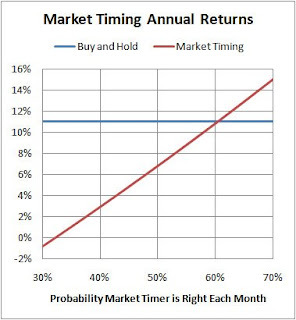 Michael: Isn't the 60% threshold dependent on the market timer randomly exiting/entering the market every month? It just seems to me that if one employs a different strategy (like buy only after a drop and sell only after a rise), then they may not have to be right 60% of the time. Possibly less. But then again, not all truths are intuitive in Math. I hope you get the time to re-run your experiment and will be check often to see the results. I am working on something related to the strategy you describe. It should be ready next week. Simon: I'm not sure I fully understand your question. When I perform investing simulations, I develop my own tools. I have heard of web sites that let you set up pretend accounts where you can make practice trades and have your results tracked. However, they are usually geared to option trading or day trading.